Now and then we all get over-extended, don't we? 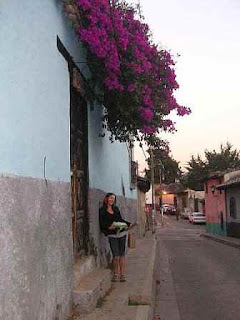 (That's me in a much happier space... Mexico... mere weeks ago. Que paso?) Well, instead of reaching the point of no return where I snap, say f#*k trying to do anything productive in the world, and wile away my life under a nice bottle of scotch, I've decided to call for some backup. So that I can pursue some related projects, keep my job, and hopefully my sanity, I have invited two "guest bloggers" to join me for the time being. May I introduce you to my guest blogging lasses: Molly, my 'lil sis (known here for her dumpster diving college days, video-making skills, and general backbone to the operation), and my friend Becky, (all-around lifestyle inspiration, commenter extraordinaire with her own blogging chops--remember her call to "Feck driving"?). They'll be adding their voices to the mix as they report from the front lines of their own efforts to make their lives more sustainable. Welcome, lasses! Also, just cuz I'm feeling feisty, there won't always be a "tip of the week". Yes, it's paradoxical: the tips of the week will be occasional. There will sometimes still be broad general themes, but we might focus more on shorter entries, such as the one about the Lush deodorant, below. And aw heck, I might start getting a little philosophical on your arses from time to time. You know, talk about how backwards things are these days. Y'all can handle it, right?